The Bauer 2018 Nexus N2900 ice hockey skate is perhaps the perfect high-volume skate for the advanced player who is on the ice several times a week, year-round, or for the intermediate player starting to play more competitively and frequently. Adults with a larger foot looking for more support and durability combined in a high-performance skate will also be wise to look closely at the Nexus N2900. Chances are they’ll like what they see. The quarter package on the N2900 boot features a 3-D injected Fiber Composite material—an upgrade over the N2700, with a significant increase in stiffness. The boot is thermoformable, lightweight, and anatomically shaped right out of the box for a comfortable feel even before the skate’s been baked for the ultimate custom fit. The outsole on the N2900 is made of Bauer’s Fiber Composite TPU material, another upgrade over the N2700, with better rigidity than the TPU material alone offers. The N2900 provides better torsional resistance—the boot and outsole’s twisting action—ideal for the intermediate or advanced-level player looking for maximum power. The N2900 includes a 48-oz, 2-piece black felt tongue with an upgraded lace bite guard. The tongue is made of high-density (HD) foam and polyethelene (PE) and features a mid-density metatarsal guard for excellent protection against pucks, slashes, and impacts. Inside the boot, the skaters will appreciate Bauer’s memory foam ankle pads that, after baking, will lock in the heel and prevent almost all of the slippage associated with power loss. The liner is a bright blue microfiber that’s soft to the touch and will wick moisture from the feet for dry comfort. Under all the plushness sits Bauer’s Form-Fit footbed. The Form-Fit footbed includes a tacky texture in the heel that, combined with the liner, provides maximum comfort and stability. All skates in Bauer’s Nexus line are high-volume. If you have a broad forefoot, high arch, or a deep heel, the Nexus line should be the perfect fit for you. Bauer has another winner with the Nexus N2900. For reasonable dollars you can get an anatomical, thermoformable skate that offers the serious intermediate or advanced player top-level performance features with plenty of room and protection.for more time spent on the ice and less time on the bench. Heat Moldable: Yes Improves break-in time. Holder: Tuuk Lightspeed Edge Type of skate blade holder. Runner: Tuuk LS1 stainless steel Type of skate blade. Tongue Material: 2-piece 40oz felt Type of material and design of the tongue. Boot Construction: 3-D fiber composite Type of material the product is primarily made of. Liner: Hydrophobic microfiber Type of inner liner material. Outsole Construction: Fiber composite Type of material the outsole is made of. Footbed: Form-Fit Type/Brand of footbed in each boot. Warranty: Boot 90 Days, Holder/Runner 1 Year Period of time the product is covered under a manufacturer's warranty. Product Line: Nexus The product line within the brand. 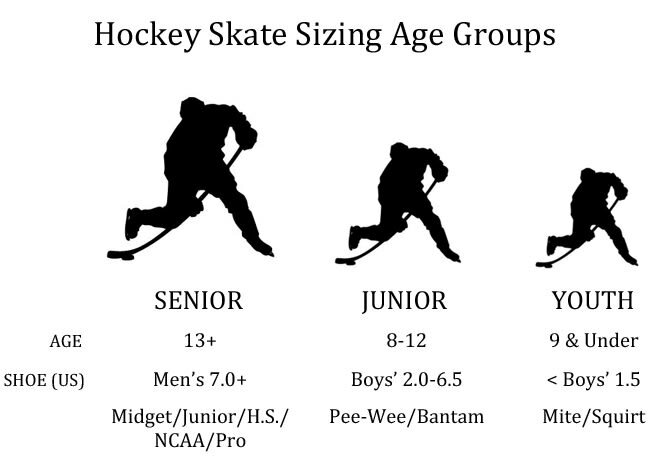 Senior hockey skates are sized to fit adults and full grown teenagers with a Men's US shoe size of 7 or greater. Junior hockey skates are sized to fit kids in the range of approximately 8 to 12 years old with a US shoe size of 2 to 6.5. Youth hockey skates are sized to fit toddlers and young children in the age range of approximately 9 years old and younger with a US youth shoe size of 1.5 or smaller. The difference between men's shoes and women's shoes is 1.5 to 2 sizes. 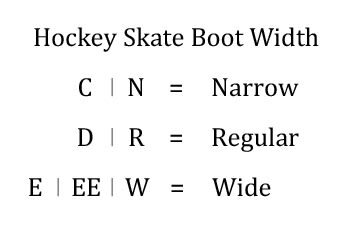 So, if you wear size 9 women's shoes, that translates to a men's size 7.5 or 7.0, which would put you in a size 6 senior hockey skate. More simply put, go 3 sizes down from your women's shoe size in order to find your hockey skate size.